21.5 INCHES LONG BY 10 INCHES WIDE. 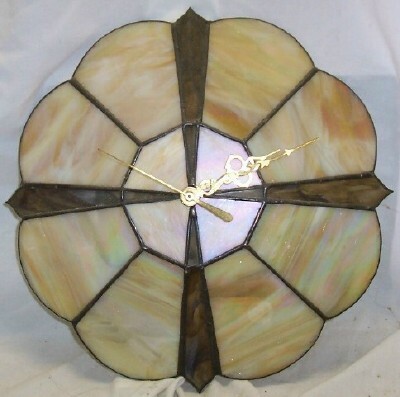 THIS CLOCK IS MADE WITH ABALONE GLASS AND RED ROSES WITH GREEN LEAVES ON IT. IT HAS BEVELED GLASS IN THE CENTER. YOU CAN CHOOSE OTHER COLORS AND STYLES. HANGS ON THE WALL. RUNS ON AA BATTERY. OF COLORS. 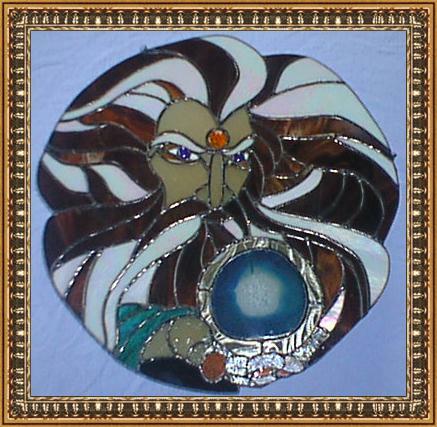 CAN HAVE A BRASS FACE PLATE OR A GLASS FACE. CAN HAVE NAMES AND/OR DATES ENGRAVED ON IT. THIS CLOCK HAS A MIRRORED CLOCK FACE WITH THE MAN IN THE MOON ON THE SIDE. THE MIRRORED SECTION CAN BE COLORED GLASS IF YOU WANT. IT CAN BE MADE IN A VARIETY OF COLORS. 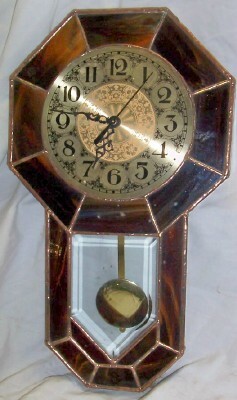 EACH CLOCK IS INDIVIDUALLY MADE SO THERE MAY BE A VARIATION FROM WHAT IS PICTURED. IF YOU WANT ONE OF THE ABOVE CLOCKS MADE IN DIFFERENT COLORS OR SIZE, CALL OR EMAIL US TO DISCUSS YOUR COLOR AND SIZE CHOICES. 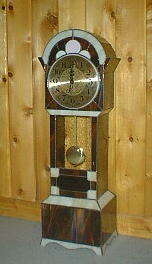 IF YOU WANT IT ENGRAVED WITH NAME AND /OR DATE, EMAIL US WITH THE WORDING YOU WANT ENGRAVED ON THE CLOCK. PRICES RANGE FROM $55 TO $800. THIS WAS MADE WITH WHITE AND BLACK GLASS. 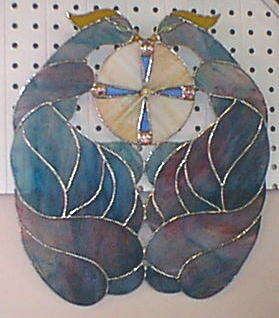 IT CAN BE MADE IN ANY VARIATION OF THE COLORS. 21 1/2 in. X 10 in. 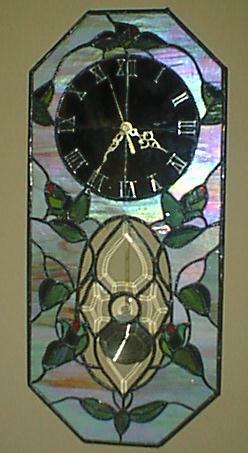 Here are some of our stained glass clocks. different address and enclose a gift card. 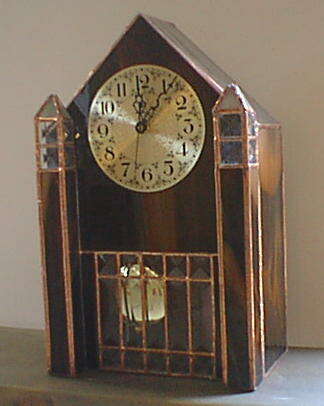 Each clock is individually made. They run on AA batteries. 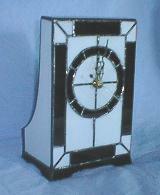 We also have other clocks available. Call, fax or email us for more information. 14 in. X 13 in. 21 1/2 in. X 9 1/2 in. CAN BE MADE IN ANY COLOR . IT CAN BE MADE IN ANY COLOR .